Alexander McQueen has launched The McQueen Collection, a collection of 8 fragrances — Amber Garden, Blazing Lily, Celtic Rose, Dark Papyrus, Everlasting Dream, Luminous Orchid, Sacred Osmanthus and Vetiver Moss — "built around" 2016’s McQueen. Amber Garden ~ "A rich oriental scent, Amber Garden fuses comforting cardamom, nutmeg and cinnamon to represent warm incense and benzoin trees." Blazing Lily ~ "Infused with the mysterious beauty of nature, Blazing Lily effortlessly combines the deep floral scent of red lilies with peppery pimento." Celtic Rose ~ "A delicately aromantic [sic] floral scent, Celtic Rose's sweet essence is formed of feminine rose petal, while spice and pepper at the base create a rich finish." Dark Papyrus (shown above right) ~ "Infused with the mysterious beauty of nature, Dark Papyrus effortlessly combines the juicy scent of blackcurrants with spicy and woody papyrus." Everlasting Dream ~ "A woody scent enlightened by the salt-heavy breeze of the sea, Everlasting Dream evokes scenes of mineral coasts and barren seashores." Additional notes include cedar. Luminous Orchid ~ "An intoxicating oriental fragrance, Luminous Orchid blends the floral scent of the fuchsia orchid with the warmth of roasted sesame. Finishing with a rich heart of bitter coffee and Tonka bean, it transports you to exotic locations." Sacred Osmanthus ~ "Sacred Osmanthus exudes an uplifting fragrance produces by light flowers of the osmanthus tree. Enhanced by Lapsang Souchong tea leaves, this floral scent gives way to a smoky, leathery heart." Vetiver Moss ~ "Harnessing the essential and mysterious beauty of nature, Vetiver Moss's natural orris root heart evokes the tranquil sense of walking across windswept moors." 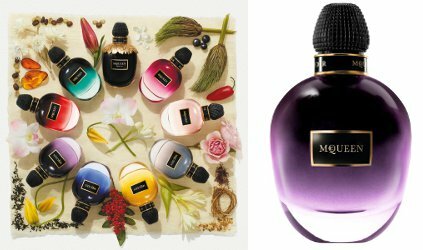 Alexander McQueen Amber Garden, Blazing Lily, Celtic Rose, Dark Papyrus, Everlasting Dream, Luminous Orchid, Sacred Osmanthus and Vetiver Moss are available now at Harrods, £175 each for 75 ml Eau de Parfum. They will debut at Saks Fifth Avenue and Printemps in September. Will this be the massive collection where the scents are actually good? They didn’t come close to every fragrance family, but other than that, yeah. This makes me angry, and I’m the first to concede that it may be irrational, but it’s an insult to the memory of a gifted artist. Only two scents were launched under his name during his lifetime, and they weren’t thrown-together or cheaply made; the first one in particular was polarizing and fascinating, very much of a piece with his work and his aesthetic. There is NO WAY that all eight of these scents are good: they’re a cynical cash grab and nothing more. Not irrational at all in my opinion, pyramus, I completely agree with you. Worked with a young lady some years ago who was a massive fan of his but not so much of the organisation ‘s path since his untimely death. Definitely a money grab, as you mention. I’m almost finished a very interesting & well written book about the rise & fall of Alexander McQueen & John Galliano. I just saw the documentary McQueen and found it so exhilarating and sad at the same time. He was a favorite designer of mine. Carolyn, what’s the name of that book? I’d be interested in reading it. SmokeyToes, I’d no sooner switched off for the evening than I realised I should have mentioned the book’s name & author! It’s called “Gods and Kings: The Rise and Fall of Alexander McQueen and John Galliano” by Dana Thomas, published in paperback (here in the UK anyway) in 2015. I do hope you can find a copy & go on to enjoy it. I’m looking forward to the documentary too, but living where I do I imagine I’ll have to wait for it on TV. On the Scottish Gaelic channel a good few years ago now, which I would never normally check, not being a speaker of the language, there was a documentary about McQueen’s connection with his Scottish roots, a connection he discovered later in his life, & his visits, & of course his burial place on the Isle of Skye. It was subtitled, thus I was able to watch it – interesting & moving. Here’s the link to the BBC info about it, although it may not be much help! It may give you a starting point as you’re such a fan, though. Depending on where you live, even the link may not work – if so, give me a shout & I’ll see what else I can find. Thank you so much!! I’ll watch it when I get home tonight. A friend is a professional photographer/stylist who shot Fashion week for many years. Her behind the scents at McQueen were amazing. I saw and loved that documentary, too. I was a fan of his work and was fortunate enough to make many visits to the exhibition of his work in NYC in 2011…unforgettable. Right there with you, pyramus. Right there with you on the money grab. I think I’ll spray some Kingdom on at bed time tonight. Sadly I’ve never tried it but I think I’d love it! I keep my eyes peeled for it when I’m searching my spots though. I completely agree with you Coumarin. I’m looking forward to these. It’s a bit much volume, but I think will be fun to try. I kind of like the idea of an “aromantic” scent.